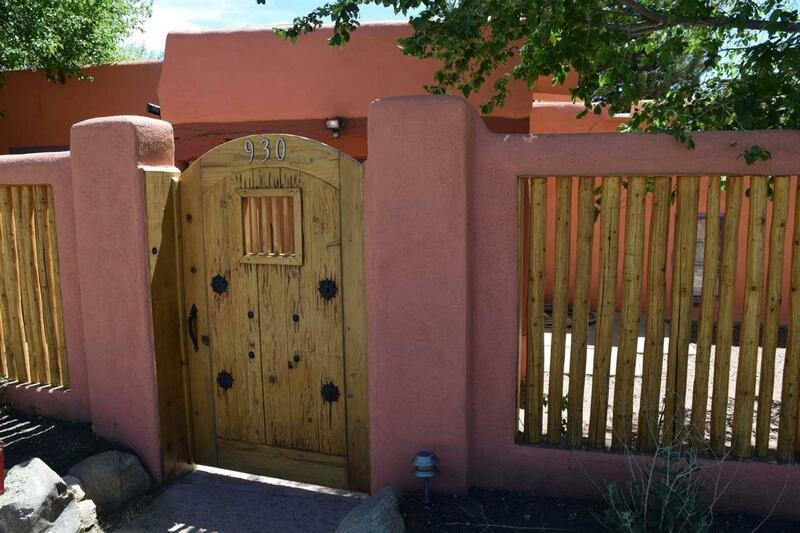 930 Kit Carson Road, Taos, NM 87571 (MLS #101727) :: Angel Fire Real Estate & Land Co. Beautifully maintained original adobe home and casita in desirable Caon area. This Pueblo style 1,696 square foot 1 bedroom and 1 bath main home offers a combination of Old World charm and modern comforts. Built in the late 1800s and remodeled in the mid 1970s, this home boasts of a colorful palette throughout, viga ceilings, 3 kiva fireplaces, wood and tile floors reminiscent of old Mexico. Upon entering the front door from the landscaped yard, the living room is welcoming. Built-in shelves and kiva fireplace provide the perfect spot to sit and read one of your favorite books while staying warm by a fire on a cool night. Or enjoy dining al fresco under the large covered portal on a warm day. Adjoining kitchen (part of the original two-room adobe) features banco and kiva fireplace. Steps up from the kitchen lead into the family room added in 1980. Pass through window to wet bar with sink and beverage fridge perfect for entertaining. Closets, ample storage and 2 exterior doors for use as additional guest quarters for private separation. Bedroom with kiva fireplace and bath with jacuzzi tub for quiet relaxation. A 357 square foot 1 bath casita is perfectly suited as a an artist studio, office or guest quarters for family and friends. Wraparound Trex deck overlooking the Rio Fernando de Taos for enjoying your morning coffee. 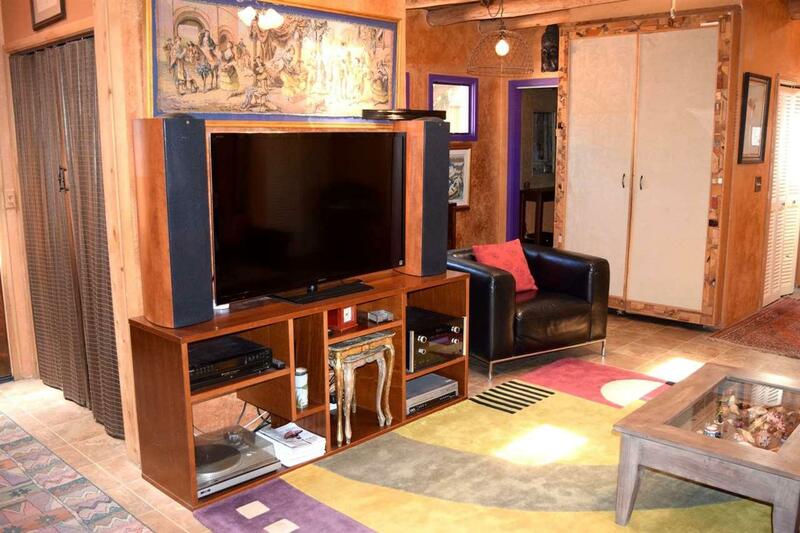 Adobe studio for additional live/work space or for guests, storage shed and two detached 1 car garages. Beautifully landscaped gardens, mature trees, fruit trees, lawn and terraced yard with petanque court (bocce ball). Property is completely fenced and walled with electric gate for privacy. Tranquil and serene ambiance of this private retreat on .575 acre with water rights. Natural gas, community water and electric. 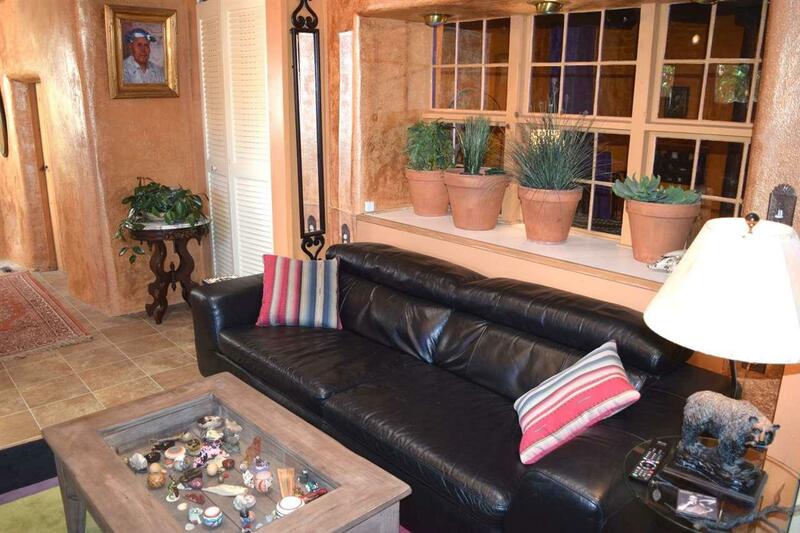 Conveniently located minutes from Taos Plaza and trails into Forest Service land. This property is so versatile...could be used as a short-term rental, or casita perfect as an office for a work from home scenario. The possibilities are endless! A must see!